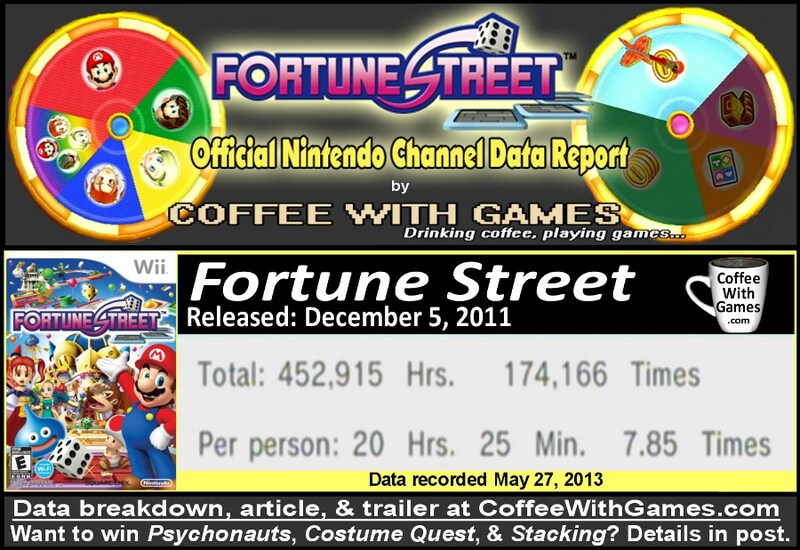 Fortune Street now has approximately 22,186 U.S. Wii owners who have just over 450,000 Total Hours of game-play reported, with about 539 days reported. This is an increase of over 10,000 more U.S. Wii owners with game-play data reported for the game, and just over 300,000 more Total Hours of game-play reported, compared to when we looked at it last May. U.S. Wii owners have averaged a total playing time of 20 Hours 25 Minutes "Per person", which averages out to be about 2 Hours 36 Minutes played per time reported; at least according to the data from the Nintendo Channel. 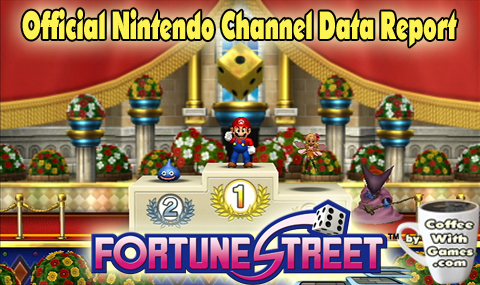 This means each session U.S. Wii owners are playing Fortune Street, they are putting over 2 1/2 hours into the game. Are those supposed to be wheels of fortune in the top portion? How does Fortune Street compare to other board game Wii games, in the reported average hours "Per person" section? Compared to the popular Mario Party games, Fortune Street's reported average hours "Per person" is lower than both Mario Party 8's and Mario Party 9's, by about 5 hours. Compared to the Wii's Monopoly games though, MONOPOLY and Monopoly Collection, Fortune Street has a slightly higher reported average "Per person". What about the critic and customer review averages for the game, have they changed much in the last year? Fortune Street's "professional" critic review score average has increased slightly, now sitting at a 70.07% critic review score average, based on 28 reviews on GameRankings.com. Its customer review score average has increased pretty significantly since last year though, and is now sitting at an 80.43%, based on 138 reviews on Amazon.com. The customer review score average has increased by nearly 15 percentage points and more than doubled the number of customer reviews in its average, compared to the last year. Like last year, I still haven't played Fortune Street, and with how much Bean 1 enjoys games with the word "Mario" in their titles, I don't know if I would grab Fortune Street first, or one of the Mario Party games instead. I know they offer different game-play experiences, but from some of the customer reviews it seems that the Mario Party games are more suited for younger children, than Fortune Street is due to its learning curve. I do find it interesting that Fortune Street has a higher reported average "Per person" than the Monopoly Wii games though, as those games should definitely have more name recognition here in the U.S. market, but perhaps the online multiplayer aspect in Fortune Street has really benefited the game. If you are interested in a chance to win Psychonauts, Costume Quest, and Stacking, simply make sure you're following me on Twitter, HERE; and tweet this post out using the Twitter button beneath the post (seen in the image below). Also, include the hashtag #FortuneStreetCoffee and tweet it to @NintendoAmerica as well. The winner has been announced, HERE. Have any of you been playing Fortune Street consistently over the last year, and if so, do you know how your hours played compare to the average reported? If you play the game pretty consistently, how is the online community now? Is it easy to find an online game against other players, or is it better if you know people to play the game with? Also, if you own a Wii U and Fortune Street for the Wii, do you think the game could benefit any in game-play because of the GamePad, if Square Enix was to port it over to the Wii U? Matt over at Digitally Downloaded loved this game - but I never did get around to trying it, despite him recommending it to me on several occasions. I have seen him and a few others commenting on Twitter from time-to-time about playing the game, but I don't think it has been recently. As for playing it, it's kind of funny (or, sad) because I downloaded the iOS app for it last year, and still have not attempted to play it. I guess that goes with not really owning an iOS device, but having someone in the house who does? Yay! Thanks for posting this Coffee :-) Good to see the game has had a healthy growth in numbers over the past year despite being so niche. 2.5 hours sounds about right, really - that's about how long a typical game would take to complete, on average I would say. I've had games go for 5-6 hours, but on the smaller maps they can be over in 1 - 1.5 hours. 20 hours on average in total seems a little small - suggests that most people who own the game have not completed it, or even unlocked the awesome bonus maps. To put into perspective - I only finished unlocking everything in-between playing multiplayer games at the 100-hour mark. As for the iOS game, it's faster to play and doesn't quite have the same personality, but the same formula is there and it's one of my favourite games on the go. I will say though the Itagaki Street (the Japanese name) Chocobo game - Dice De Chocobo - on the PSone is still my favourite game in this long franchise. I bought it brand new for $17, which was a good find. I'd play it about once a month for one game, so about an hour and a half I guess. I never successfully got an online game going, unfortunately! The local multiplayer is good though,and the game can be more involved and complicated depending on what mode you pick. My brother played it a couple of times and loves it, so he's had my copy for a few months. All in all, I prefer Wii Party, but I've never played a Mario Party game, so it's hard to say. "I've had games go for 5-6 hours..."
Have you attempted any online game in this recently, or would you say it's probably best picked up only for the single-player component now? I never played Wii Party, or any of the Mario Party games...so I don't how how they really compare to each other either. 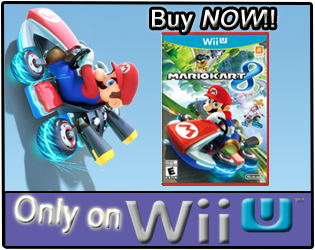 Knowing the local multiplayer is good, makes me think this might be a good game for Wii U owners perhaps looking for a "Monopoly" game, but one that offers something a bit different. I haven't played online for a while, but the nature of this game (long games) means that it was never the best game for random matchups. If you've got some friends with Friend Codes then it was always a good experience online. But for me the value of this game has always been in local multiplayer. One of my favourite local multiplayer games ever. Yeah, it doesn't really compare to the Nintendo board games. Nintendo didn't develop this game, for a start - Marvellous AQL did, and although it features Nintendo characters, this is one game in a long franchise of Japan-only games that Square Enix owns. 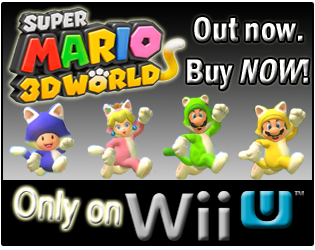 The only link between this and Mario Party or Wii Party is the presence of Mario characters under license. As for the comparison to Monopoly, that's fair, although this game also has a reasonably complex 'stock market' which is where the real money is made in the game, and I would say that is the focus, rather than the buying of properties. In fact I have won this game before without buying a single property, haha. "But for me the value of this game has always been in local multiplayer." That's good to know, and a good selling point for me anyway. Question about the local multiplayer, can the games be "paused" in any fashion, like...saved in the middle of a game, and started again later? Or, should you prepare to sit and play like a real board game? It's been a couple of months since I've last played local multiplayer, but I am 99% certain that you can pause the game and pick it back up again another day. coffee and games may be the wonderful combination. The first winner has been contacted, and there will be more small giveaways like it in the future, but with different entry methods.